Bhutan will now have better access to import improved variety of seeds from six other member countries of Seeds Without Borders (SWB) project. Including Bhutan, SWB has seven member countries-Bangladesh, Cambodia, India, Myanmar, Nepal and Sri Lanka. To formalise the deal, the Ministry of Agriculture and Forests signed the seed agreement with SWB last month. The signing was coordinated by the International Rice Research Institute based in Philippines. The agreement states the member countries can import improved and commercially available variety of seeds from each other without much restriction. Earlier, it was difficult. Wangda also highlighted other positive aspects of the agreement. 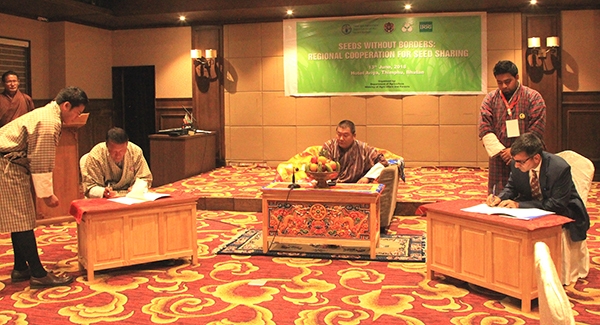 However, agriculture officials say Bhutan will currently focus on cereal based seeds such as rice, maize, and pulses. The agriculture ministry’s 2018 report has highlighted 23 varieties of rice grown in the country.